If you want to have a truly memorable night out, then the party bus is just what you need. Also referred to as the Club Cruiser or Nightclub on Wheels, this 16-seater bus will ensure that your night out gets off to the best possible start. We offer one of the most affordable party bus hire services in the country. Chauffeur driven, it’s the ideal way to enjoy a night on the town without worrying about appointing a designated driver. 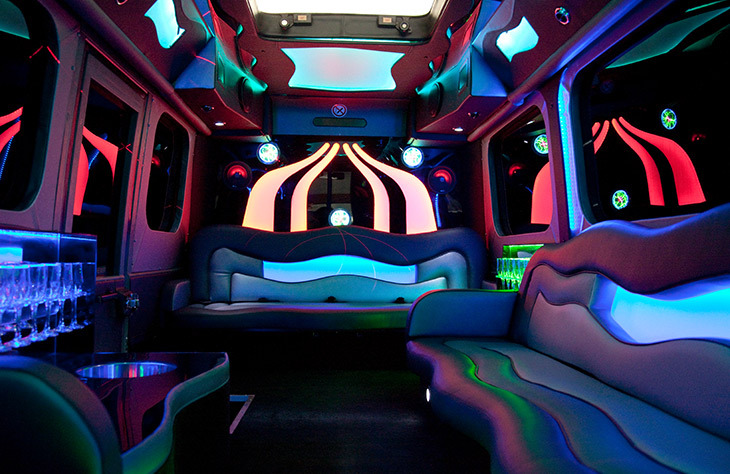 Make Your Night Memorable with the Party Bus! One of the main things that surprises people when they use the party bus is the fact that it has a nicer interior than many limousines. You will be able to sit back and relax in leather seats, with plenty of room for your head and legs. There is also a bar, as well as a colour changing ceiling. What more could you possibly ask for? Also featured on the party bus are 8 LCD TVs, a massive surround sound system including 3 subs, a dance pole and a personalised message screen. This is the perfect hire car to rent out when you next fancy a night on the tiles. 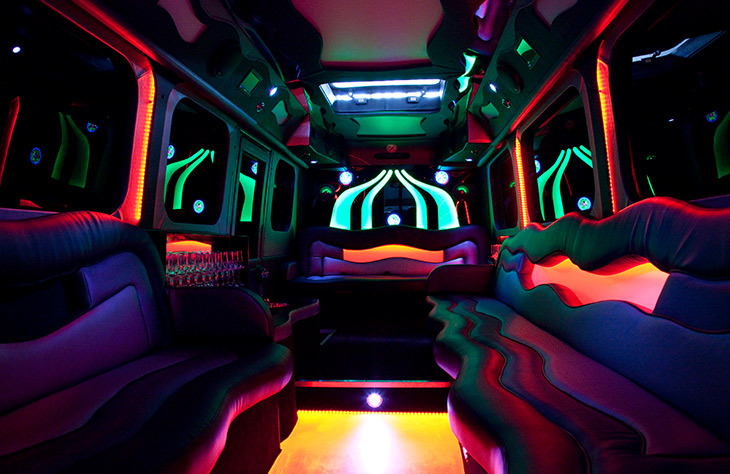 Our party bus is unlike any other you’ll find on the market. It has been especially designed for us, custom-built to our own specifications. So, while there are many party buses available to hire in the UK, none can match the features and luxury included in ours. We have included many awesome features to enhance customer experience. Why not arrange a viewing to see just how luxurious this party bus is? You can call us today to arrange a viewing, with no obligation to book. When you see just how luxurious our party bus is, you’d assume it would come with a high price tag. However, we believe in offering our customers the best value for money. That’s why our party bus hire comes at a competitively low price. We also make it even more affordable by offering numerous hire package deals. These typically come with plenty of extras and are designed to save you as much money as possible. Our package deals do change from time to time so always contact us before booking to see what deals are currently available. If you’re booking as part of a large group, you’ll also find it easy to spread the cost between you. Want to save further money? Why not book this incredible party bus during off-peak times? You’ll also find by booking early, you’ll have access to exclusive discounts. Whether you’re looking for the perfect hire vehicle for your stag or hen party, or you’re simply looking to enjoy a memorable night on the town, our party bus hire service is ideal. Contact us now to book this impressive vehicle, or to learn more about our existing package deals. Be aware that our party bus does get booked up quickly, particularly during peak wedding and prom season. So, if you have a set hire date in mind it’s worth booking as early as possible to avoid disappointment.